Jerusalem Post columnist Caroline Glick warns today about the fragmentation and rancor in American politics. From her post in the Middle East, Glick warns that the rhetoric from the Ron Paul, Mike Huckabee and Barack Obama campaigns is a real concern. 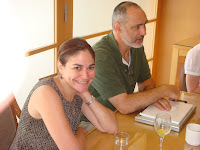 Jerusalem Post columnist Caroline Glick sits with Richard Landes, the creator of Pallywood the movie, during a discussion with American bloggers in Tel Aviv last August.